Henry Cooper's Training Skipping Rope was invented by Albert Rayner the world speed skipping record holder. It looks right, it feels right and because of its unique design it helps you to skip the natural way from the wrists. The rope doesn't tangle and you can easily adjust the lenght to suit. 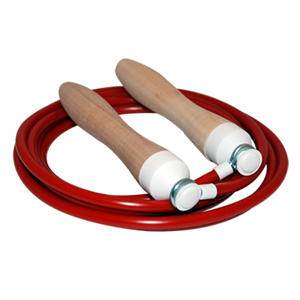 Henry Cooper's Training Skipping Rope has been made by craftsmen to a very high standard in our own factory. We trust it will give you many hours of fun and pleasure as well as helping you to improve your physical fitness. 9ft long.